With less than two weeks to go before YAL DC Weekend 2008, it’s finally time to remove all of the important TBDs and announce some actual venues. As this was the second YAL Conference in DC this year, with the National YAL Conference having taken place back in July, the organizers strived to provide a different experience to encourage those out-of-towners who may have been here in July to return to DC for the best of what this area has to offer. The Key Bridge Marriott will serve as our official hotel for the weekend. Despite its Arlington address, this hotel is a short walk into the heart of Georgetown, the closest we have ever been to this famed social and shopping neighborhood, while still being on the Orange and Blue lines of the Metro to get to DC’s landmarks and museums. It’s a hotel that offers DC views at Virginia prices. Skipping past Thursday night for a moment, we’re excited to finally be able to announce the venue for the Friday Night Greek Night featuring DJs C n’ D from Detroit. The Muse Nightclub & Lounge will host us on only the second night of their actual opening, where we will have exclusive access to all three floors of a newly renovated ultra-posh club. Located near the Verizon Center and DC’s bustling Chinatown neighborhood, it will offer many possibilities for grabbing dinner before heading out to Greek Night. It’s conveniently located on several Metro lines for those staying at the hotel and those coming in from the Maryland suburbs. Saturday afternoon’s happy hour will be at McFadden’s, at the top of Georgetown, blocks from the Foggy Bottom Metro Station. This location will work well for those spending the afternoon shopping in Georgetown or at the downtown monuments and museums. In our never ending search for new venues to host the main event of the weekend, Saturday Night’s Semi-Formal, we’re moving the dance away from a hotel ballroom or even a church hall to Caribbean Breeze in Arlington’s Ballston-Virginia Square neighborhood. As a result, the heavy hors d'oeuvres menu will feature everything from baby lamb chops to spanokopita to empanadas. Live Greek Music for the evening will be performed by Baltimore’s own Neo Kyma. The organizers are expecting a very good turnout of folks spanning the entire YAL age range. In what has become a Sunday Night tradition at YAL DC Weekend, Ultrabar again opens its doors to host the final Greek Night of the weekend. Lately many have looked forward to this event as much as the others as it has offered a slightly smaller crowd of locals and diehard out-of-towners a chance to wrap up the weekend on a night when DC isn’t as packed. Despite the National YAL Conference being here a few months ago, our registration and hotel projections still show plenty of people coming in from out of town. 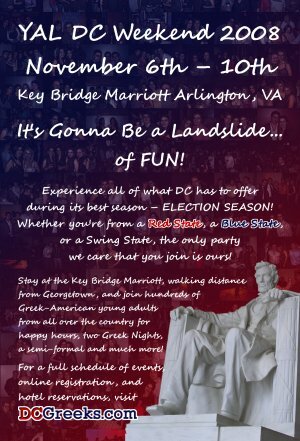 YAL DC Weekend always works because of the lack of over-scheduling allowing for Greek Americans to enjoy different aspects of DC at their own pace. Taking a cue however from some of the other YAL conferences from across the country, we’re introducing our first ever spiritual discussion at brunch after church on Sunday at St. Katherine. The topic will be the always relevant, “Dating, Marriage, and Interfaith Relationships.” We’ll be releasing any last minute details as they become available, so please check back with www.DCGreeks.com/YALDCWeekend.